Unlike most Pokémon games, the core aspect of progression isn't tied to the Pokémon, but rather in this case it is tied to the trainer. When you start the game, you have the ability to customise your trainer with a few preset options, as well as choose its name. 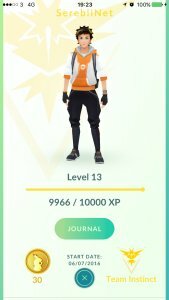 When you reach Level 5, you can also assign yourself a special Team to fight for: Team Instinct, Team Valor & Team Mystic. You can also collect medals which you can see in the trainer section on the bottom left of the screen. The key part, however, is experience. Whenever you do something in the game, your character will gain experience and eventually level up. As your level increases, you will discover more Pokémon and face Pokémon with stronger Combat Points in the wild. You'll also get various perks and unlock new items. Practically everything that you do will give you experience, from checking a PokéStop to catching a Pokémon. You can also double the experience you gain for 30 minutes by using a Lucky Egg item.